Can you spare a minute… or 10? Can you play with me? How many times has your child asked you this question? For me, it is usually my 5 year old asking me to play animals with him. Now for those of you who are not familiar with the game “animals”, let me share. Basically, it’s very similar to Barbies or baby dolls but with stuffed animals. The stuffed animals are usually some cross between a ninja, Spider man & Luke Skywalker. They turn flips, karate chop each other and speak a language known only to my 5 year old… He often has a script laid out in his mind that I have to follow. I can always think of about 100 other things I need to be doing around the house when he asks me to play. Just last week, I was in the middle of cooking dinner when he asked me to jump on the trampoline with him. When I said I couldn’t because dinner would burn if I left, he just looked up at me and said, “You never jump on the trampoline.” OK, that’s not entirely true, BUT in the mind of a 5 year old that I’ve just said no to, it may as well be. 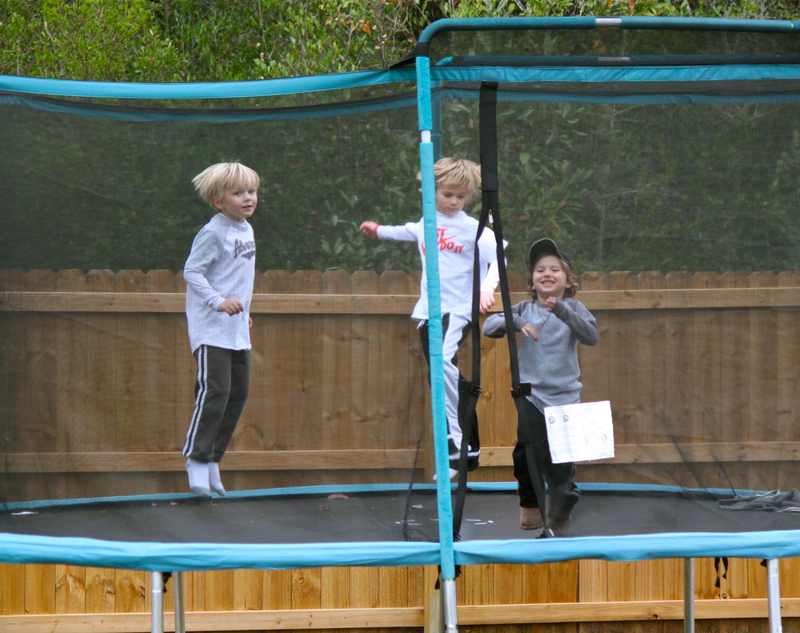 I’ve thought about that quite a bit the last 24 hours… what do you think we made time for this weekend… Yep, jumping on the trampoline! I am always reminded when I stop what I am doing and focus on one of my kids for a brief moment, they are encouraged and feel valued. It only takes a short amount of time to show your child that you love them and that you will stop your work to spend time with them. A child feels more confident and secure knowing that you care enough to stop and play! Has there been a time recently when you just dropped whatever you were doing to give 10 minutes of play time to one of your kids?? Very well said! I so often don’t “feel” like playing with my children, but when I do I wonder (most of the time) why I don’t stop and do it more often. It means so much to them and I know will be a cherished memory of mine down the road. Denise how true. I say the same thing in my mind after I play too. It is so much fun and relaxing in the midst of a hectic day.